After several hours of silence, Islamist Yassin Salhi finally confesses to his gruesome crimes in Friday terror attack in Lyon. The Muslim extremist suspected of decapitating his boss in an attack on a gas factory in France has confessed to the grisly crime, sources close to the investigation said Sunday. Terrorist Yassin Salhi, 35, "has also given details about the circumstances" surrounding the killing, according to the sources, who said he would be transferred to Paris for further questioning later Sunday by anti-terrorist police. Salhi's confession came after it emerged the married father-of-three sent a gruesome selfie photo of himself and the severed head to a WhatsApp number in Canada. Investigators have warned however that it could be a relay number and the intended recipient could be anywhere in the world. After several hours of silence, Salhi has begun to open up to investigators about the assault, which came six months after 17 were killed in Islamist attacks in Paris that began with the Charlie Hebdo massacre. On Friday morning, Salhi rammed his van into the US-owned Air Products factory near France's second city of Lyon in what President Francois Hollande said was a "terrorist" attack designed to blow up the whole building. He was overpowered by a firefighter as he was trying to prize open a bottle of acetone in an apparent suicidal bid to destroy the factory. Police then made the grisly discovery of the severed head of Salhi's boss, 54-year-old Herve Cornara, lashed to the gates of the factory near two flags on which were written the Muslim profession of faith. Prime Minister Manuel Valls repeated that the world was engaged in a "war against terrorism." "We cannot lose this war because it's fundamentally a war of civilization. It's our society, our civilization that we are defending," Valls told iTELE rolling news channel. France is facing "a major terrorist threat" which needs to be fought "over the long-term", warned the prime minister. It's not a question of whether there will be another attack, but "when" and "where", stressed Valls. Friday's attack came on a day of bloodshed on three continents that saw 38 people mown down on a Tunisian beach and 26 killed in a suicide attack in Kuwait. The Islamic State extremist group has claimed responsibility for those two attacks but no group has said it carried out the French attack. Sources close to the investigation said Salhi was radicalized more than a decade ago after contact with Muslim convert Frederic Jean Salvi - known as "Ali" - who is suspected of preparing attacks in Indonesia with Al-Qaeda terrorists. An autopsy on the victim has proved inconclusive, with experts unable to determine whether he was killed before being beheaded or decapitated alive. The French probe is naturally focusing on Syria, where hundreds of people from France have gone to wage jihad, officials said. Anti-terrorist authorities have identified 473 people who have left France to fight in Iraq or Syria and Valls said 1,800 people in France were "linked" in some way to the jihadist cause. 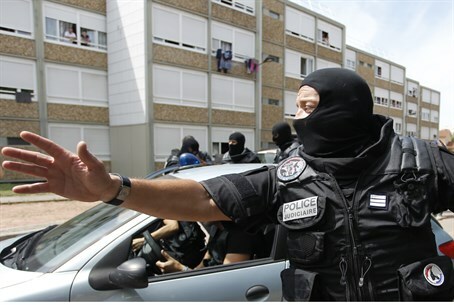 Like the Charlie Hebdo attackers and Islamist Mohamed Merah who gunned down soldiers and Jewish children in the southwest city of Toulouse in 2012, Salhi had been known to French security services for "radicalization" but slipped through the net. Interior Minister Bernard Cazeneuve said Friday Salhi had been investigated for links to radical Salafists in Lyon, but was not known to have participated in terrorist activities and did not have a criminal record. Europe has for months been bracing for so-called "lone wolf" attacks by supporters of Islamic State, which has urged its followers to strike wherever they can. France, which has the highest Muslim population in Europe, last week passed a controversial new spying law granting sweeping powers to snoop on citizens.